The Church at Carrs Lane in Birmingham City Centre organised ‘Coming Together’ to welcome refugee groups from around the city during Refugee Week. The event included poems and stories written by refugees. A local rabbi introduced a film clip of her father and a Syrian boy, both refugees at different times. This brought a moving silence. 'Choir with No Name', a group of local singers sang and there was also a scratch choir made up of choir members, refugees, and church folk. Refugees from at least nine countries, and at different stages of the refugee process in the UK, attended the event. 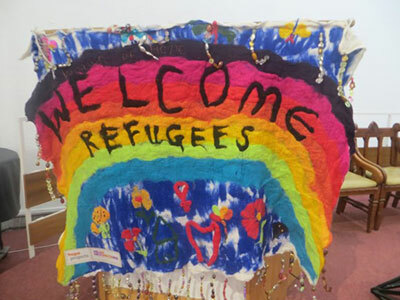 The Church at Carrs Lane and Birmingham Progressive Synagogue regularly run a welcome afternoon for refugees living in central Birmingham, at which they eat and practice English together.